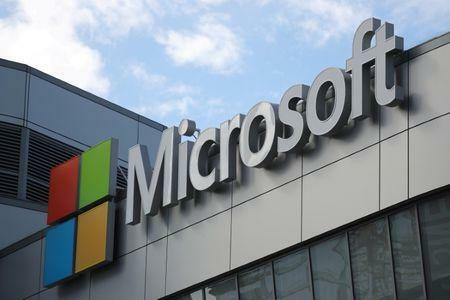 (Reuters) - Microsoft Corp shares rose about 5 percent to an all-time high on Friday, after investors cheered another blockbuster quarter, backed by growth in its legacy software business and Azure cloud computing services. Shares of one of the technology world's oldest and best-known names rose nearly 4 percent to $108.20 in early trade, adding more than $30 billion to a market capitalization that was already $802 billion at Thursday's close. At least six brokerages raised their price targets on the company's stock after the results. Helped by a boom in demand for cloud-based software, Microsoft has more than doubled in value since Satya Nadella took over as chief executive in 2014 and refocused the software behemoth on newer businesses. While Microsoft's core productivity and business processes unit, which includes the Office 365 software suite, rose 13.1 percent to $9.67 billion, revenue for the Azure cloud service jumped 89 percent. "Based on the results, they were able to beat on all major metrics that people were focusing on. I don't see anything that should raise an eyebrow of concern", said Daniel Morgan, a portfolio manager at Synovus Trust who holds 418,716 Microsoft shares. Microsoft has been investing heavily to bolster the fast-growing cloud business and catch up with market leader Amazon.com Inc's Amazon Web Services (AWS). "Given the competitive market and need to invest in both capex and operating expenses, profitability along AWS's level may prove elusive for Azure for several years, if not forever," Jefferies analysts said. Microsoft also competes with Alphabet Inc , IBM and Alibaba . According to research firm Canalys, AWS is beating the competition in terms of market share, followed by Microsoft, which continues to grow faster than AWS, as of April this year. Google was ranked third. "Our early investments in the intelligent cloud and intelligent edge are paying off, and we will continue to expand our reach in large and growing markets with differentiated innovation," Nadella said on a conference call on Thursday. Analysts expect the investments to pay off in the long run and provide rich dividends to shareholders, allowing Microsoft to rival Apple Inc and Amazon in the race to be the first company worth $1 trillion. "Our view on MSFT is unchanged: the stock is our favorite large cap name and we expect MSFT to deliver 10-20% annual stock price appreciation for the next several years," Canaccord Genuity analyst Richard Davis wrote in a client note. Of the 35 analysts covering the stock, 31 have a "buy" or higher rating, three are on "hold" and only one on "strong sell". "Microsoft has successfully come from behind to exceed Amazon's cloud revenue, and that gap is only increasing in Microsoft's favor," Mark Sami, vice president at consultancy firm SPR said. "I predict that Microsoft's cloud market share will continue to grow and impress investors."